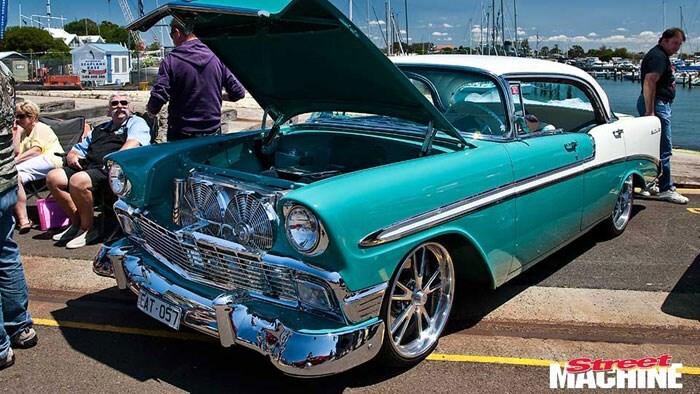 ONE of the neatest car show venues we’ve seen in our travels is the Seaworks Maritime Precinct, in Williamstown, Victoria, where the Smokin’ Aces club held their second annual Aces by the Bay event. Held in conjunction with the Point Gellibrand Rotary Club to raise funds for Challenge Kids with Cancer, Aces by the Bay was filled to capacity by the time we rocked up at 10am, with the surrounding streets filled with hundreds more stove-hot streeters. Inside the venue, those that were canny enough to pre-enter were able to park their rides against the stunning backdrop of Port Philip Bay and a bunch of cool ships – most notably Sea Shepherd’s Steve Irwin. As well as an impressive array of rides – including a heap of former and future SM feature cars – the club had a killer rock and rockabilly band pumping all day, a ton of trade stands and stuff for the kids as well. And best of all, the venue has a built-in pirate-style tavern to help the locals cool down.